This IBM Redbooks publication will help you install, tailor and configure the new HACMP V5.3, and understand the new and improved features like Dynamic LPAR integration, Virtual I/O, and Disaster Recovery (DR) configurations. This book gives a broad understanding of the HACMP and HACMP Extended Distance (HACMP/XD) architecture. If you plan to install, migrate, or merely administer a high availability cluster, this book is right for you. Disaster recovery elements and how HACMP fulfills these necessities are also presented in detail. 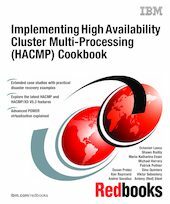 This cookbook helps AIX professionals that are seeking a comprehensive and task-oriented guide for developing the knowledge and skills required for HACMP cluster design and implementation as well as for daily system administration. It is designed to provide a combination of theory and practical experience. This book will be especially useful for system administrators currently running both HACMP/ES and HACMP Extended Distance (XD) clusters who may want to consolidate their environment and move to a new HACMP V5.3. There is a detailed description of a node-by-node migration to HACMP/ES 5.3 and a comprehensive discussion about how to prepare for an upgrade or migration.